A walk on the wild side – inadvertant acts of trespass. Saturday last I decided photograph the area of Dagenham south of the A13 – the industrial heartland. Recent demolition and construction projects has altered the face of the area significantly since I’d last paid a visit well over fifteen years ago. Back then Fords controlled much more of the land around Chequers lane and the roads were full with trucks delivered car parts and raw materials and carrying away finished cars. So on a bright sunny day I went exploring, hoping to find a way down to the Thames. Heading down Chequers Lane, past Dagenham Dock station I hoped I may be able to reach the river directly, but builders yards and light industrial parks prevent access. I did manage to get a couple of photos of the new-ish Barking powerstation on old Fords ground by the Dagenham Breech. Most of the areas was dead quiet, it seems very people few work the weekends there. I did get one or two odd looks as I stood photographing things that caught my eye, but there wasn’t really much to see. Back up the lane and heading west. I’d planned to go along Thunderer Road, which according to the maps runs right alongside the Thames and leads into some waste ground / parkland. However I missed the turn off for it and carried along Choats Road, past the old bus garage and car parks and over the Mayesbrook stream until I found a gap in the fence to access the higher ground along side the road. The top of the embankments afforded me a good view upstream and downstream and across the Thames as well as back to the power station and Fords. I could see no one obviously about to chase me away and no significant danger apart from rabbit holes so I set off across a scrub meadow down to the river. Reaching my goal of getting to the river, it seemed a good idea to see just how far upstream I could walk along the river. In the hot sun there was a heavy tar small coming from the bitumen and stone banks – I’d have thought all the volatile organics would have boiled out long ago. In places the banks are in need to some repair to prevent the collapsing away totally, in other places it is too late for repair. Scattered along the river edge and semi submerged in the Thames are various odd wooden and steel piles; reminders of past docks, piers and industrial workings. Two large weathered metal cones on poles set in the ground loom over everything – possibly radar marker? The different shapes would suggest that. The wildlife seems to enjoy the freedom and seclusion. I saw plenty of rabbits and the odd kestrel hunting them. Insects and songbirds were also in abundance. The delights of an empty pier don’t last long, so after taking a few photographs I headed back onto land. Further progress along the river side was prevented by concrete walls built up to the water edge so I headed in land try get back to a road. This is when I found myself fenced in in a deserted yard with no way out except back along the river, or under a very low, very locked gate. It being rather obvious I wasn’t supposed to be there I decided crawling under the gate was the fastest way out. A few seconds later and I’d hauled myself though the 8″ space. Reaching back under for my camera bag I looked up to see several signs warning of dogs on site and prosecution for trespassers. A few meters further down the road was an electric fence. I’d made the right choice to get out where I did. This map shows the general area I explored and photographed. The numbers link to photos. Posted on 3/5/2007 9/5/2007 Author dtlCategories Dagenham, London, Photographic, photos, Rivers & streams, Walks1 Comment on A walk on the wild side – inadvertant acts of trespass. So, I took eclipse photos on Saturday night, I filled a 1gig SD card – though at 6 meg per photo in RAW format , that’s quite easy to do. Comet McNaught (C/2006 P1) is currently visible in the low sky just after sunset – look in the direction of the setting sun about 5 minutes after the top of the sun clears the horizon. Comet McNaught caught between two houses. Taken with Tamron 70-300 mm lens at 300 mm on a Nikon D50. 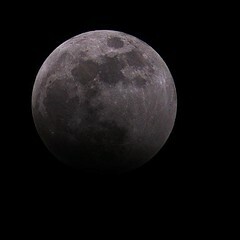 1/4 sec exposure at f8. 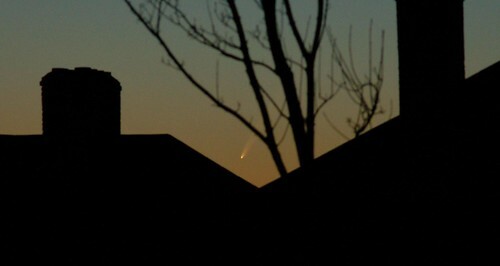 The comet was only visible from my location for about 30-45 minutes, from sundown until it vanished behind the houses. I didn’t really get time to tune the camera settings to get best results, but I’m rather happy with this image.